Ysgol Bae Baglan is instrumental to Neath Port Talbot’s plan to make significant improvements to its schools infrastructure. It combines four existing, under-performing schools and transforms them into one leading facility for 1,500 pupils aged 3 to 16. 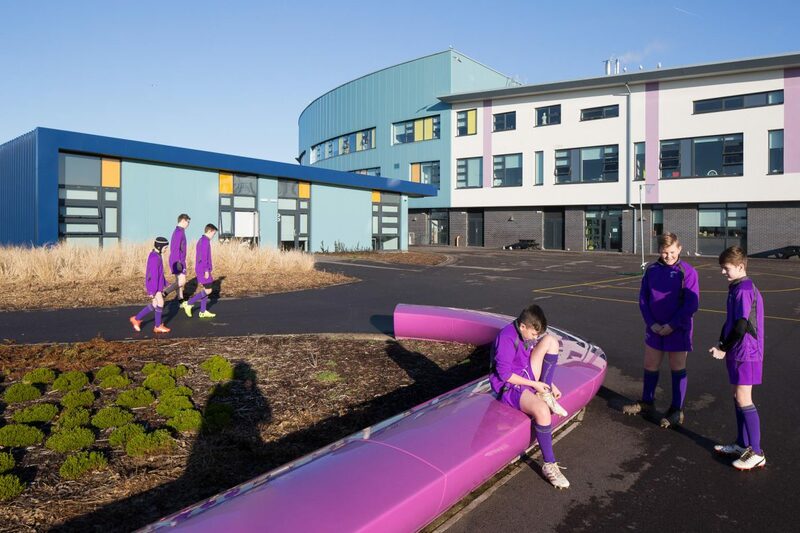 Inspired by the site’s local character and the natural flow of people around the school, two curved wings create a sheltered courtyard to protect pupils from the whipping winds that come down from the surrounding hills. 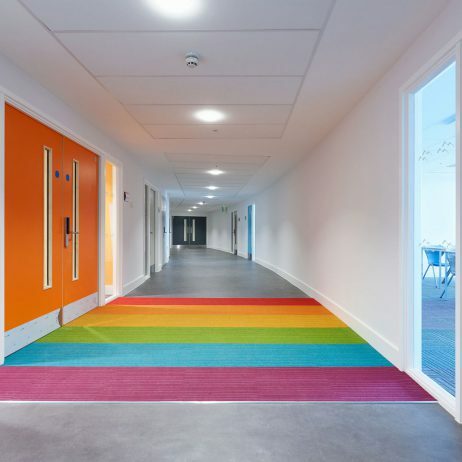 Colourful glazed curtain walling creates the impression of meadow wild flowers and welcomes the pupils before they enter the school’s central hub; a large open space with dining and performance areas. 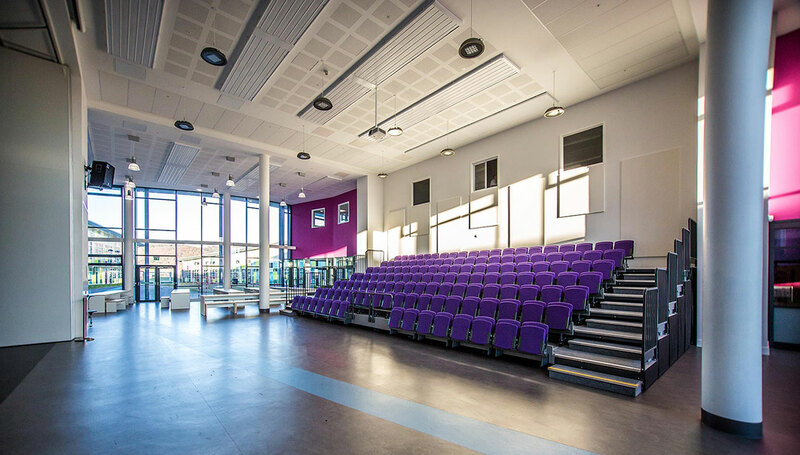 Within the central hub is one of the schools two retractable seating areas (the other is in the main hall). 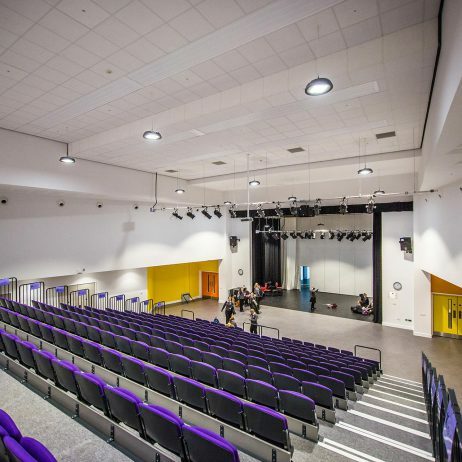 These are linked by a stage with sliding doors that can be subdivided to create a range of spaces for amateur dramatics, exhibitions, presentations and other such events. 100 of the students have additional learning needs, so we put their learning facilities at the heart of the school, helping them to become fully integrated. 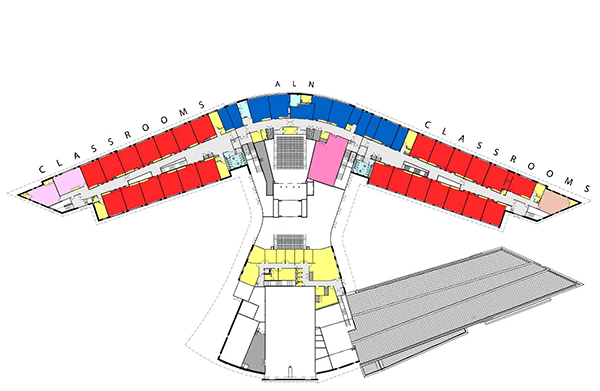 Elsewhere, different colours are used to identify the school age zones, while a double height atrium helps handle the flow of traffic and provides space for community events. Externally, we took inspiration from the rolling hills that form the backdrop to the school. The roof is rises and falls with a continuously flowing eaves line that can be seen from angles; emulating a typical run of Welsh terraced houses, where the roof sweeps continuously over them all, rather than stepping at each party wall. 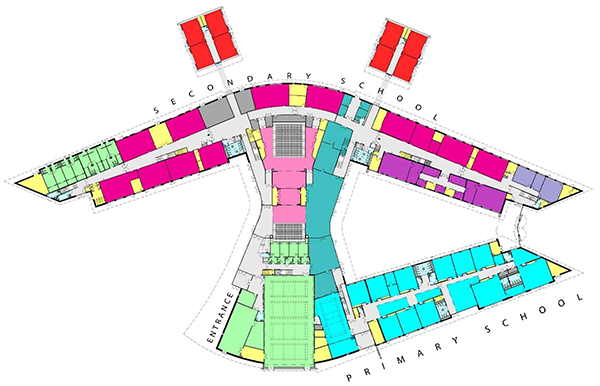 Aside the obvious nod to the schools locality, it provides a sustainable solution to a wet environment. As a ‘Microsoft school’ Ysgol Bae Baglan recognises the importance of digital skills in today’s society. Students work on a personal tablets and share information with the rest of the class through connected devices. Elsewhere, fingerprint scanners are used for cashless catering, library software and registration systems. 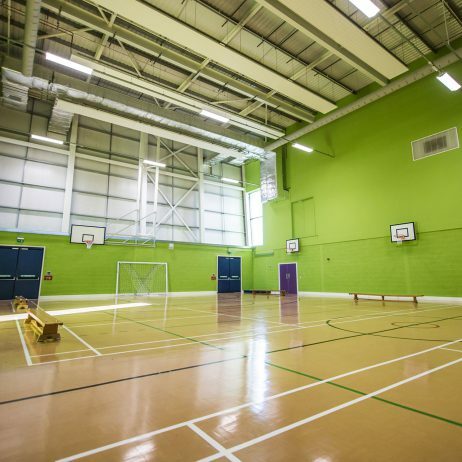 In the sports hall, individual and team performance can be reviewed on a monitor, so no more smoking behind the bike shed during cross country. 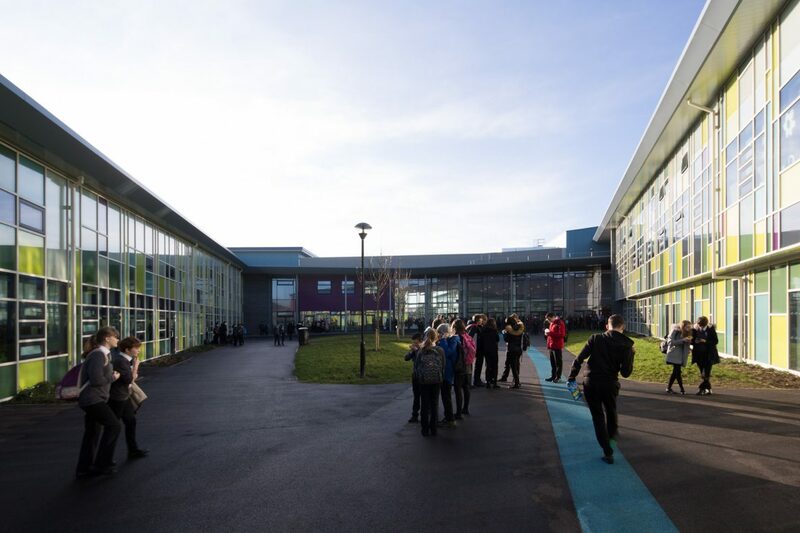 Fitting with Neath Port Talbot’s desire for an estate of energy and water efficient schools, Ysgol Bae Baglan holds a BREEAM rating of ‘Excellent’ and an Energy Performance Certificate of A. Extended use of the school is an essential for the local community. As well as providing adult learning courses, the school is open until 10pm every day for sports and performing arts activities. This provides a sustainable approach to health and wellbeing and a range of cultural opportunities for the local community. The community now have a sense of ownership over their new landmark building. Find out more below. When the project was handed over, we went back and interviewed the Inhabitants. Hear their side of the story. Our all-through school for Neath Port Talbot has won the National Eisteddfod of Wales ‘Gold Medal for Architecture!